We tried a delightful New England-area cow's milk cheese the other night called Prescott at Central Kitchen, a New American restaurant in Cambridge, MA. Two ample wedges of this semi-hard, organic, raw cow's milk cheese, aged over 8 months, were served as an appetizer, along with several hard french-style bread pieces and a sweet berry relish. The cheese itself is quite tasty, with a hint of salt, a little nuttiness, and a very smooth mouth-feel. It is a mild cheese, perhaps reminiscent of a mild gruyere-cheddar cross, with a little less of that characteristic gruyere sweetness. Prescott is one of a number of artisanal cheeses made at Robinson Farm, a family owned and operated organic dairy farm in Hardwick, MA. Hardwick is a town in central Massachusetts, about equidistant between Worcester and Northampton. The farm offers at least 3 other wash-rind, raw milk cheeses, all of which won awards recently at the Cheeses of New England competition of the 2011 Big E. (The Big E is the largest annual fair in the Northeast). 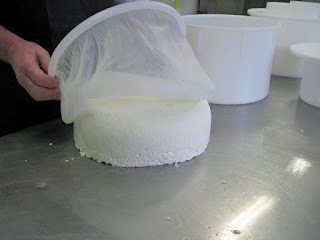 The picture (above right) is borrowed from a fantastic photographic tutorial of cheese making at the Robinson farm, courtesy of a post last year from the the New England Cheesemaking Supply company. We'd highly recommend trying some of these. You can buy Prescott and the other cheeses from the Robinson farm directly, apparently with a minimum of 2 pound purchase (@ whole sale prices). This may be your best bet if you are outside of the New England area. Get a bunch of friends to go in with you! If you're within greater Boston or around New England, a better bet may be to find Robinson Farm cheeses at one of these locations.